Now that we know who died in the Donora smog and when, let’s look at where they lived. Except for Thomas Short, who died at Charleroi-Monessen Hospital, all victims died at home. Shortly after the smog, in early 1949, the Division of Industrial Hygiene conducted detailed studies of the event, including data about each victim. It then developed a map of victims’ homes (below) to determine whether there might have been a pattern to the deaths; there was none. Nevertheless, knowing where each victim lived — and died — can be instructive in itself. First, the map indicates by its incompleteness how difficult gathering data must have been in those first weeks and months following the smog. Several locations of victims’ homes are inaccurately placed on the map, which apparently had been hand-drawn for this use. There is also a rather significant mapping error: the addition of a road (see arrow at bottom), a road that seems not to have ever existed. Second, the map shows how widespread the affected areas were, with victims coming from the southernmost areas including Cement City to the more northern area, near the Zinc Works. It also shows numerous victims across the river in Webster and its upper environs. Third, and perhaps most important, looking at the midsection of the town, think of how many of those victims and their families must have known each other. They lived within blocks of one another. Most either worked at the mills or had spouses or children who did. They visited each other’s homes, enjoyed events together, came across one another almost daily as they walked up and down the hillside or along McKean Avenue, the main thoroughfare. And their deaths must have made an indelible impression on everyone who made it through the smog. I wonder even now how many residents who lived through the fog were affected by what today we call survivor guilt and who asked themselves over and over for years thereafter, Why not me? Yes, it’s just a map of places where people died. But when you look more closely, it is so much more. 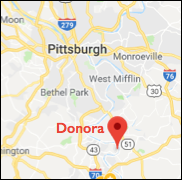 ← Who Died When in Donora’s Death Fog?